Choose Size for Mounted Icons or Laminated Prints. After Selection – Price will Show with Dimensions below. Tap Description below for Information about this Icon. The Laminated Print selections are made to order. Please allow up to 14 to 21 business days for laminated prints although they may ship sooner. This icon is part of a 1497 Russian icon (with P78 and P83) of the prophets from Dormition Church, St. Cyril of Belozersk Monastery. The Holy Prophet King David was the son of Jesse of the tribe of Judah. He was chosen by God to replace King Saul, who had been chosen by God and anointed by the Prophet Samuel to be the king of Israel when the Israelites demanded a king like other nations. 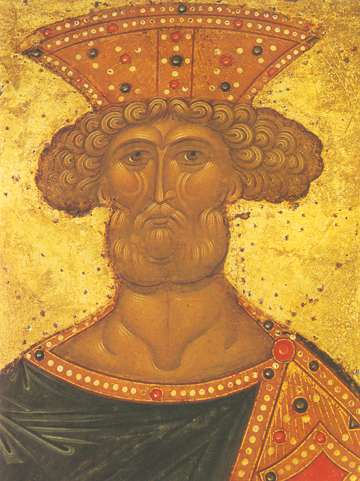 King David was a direct ancestor of Christ, lived from 1040 to 970 b.c., and was the father of King Solomon. This saintly king was known for both his bravery and courage in defending God and His People, and also for his sensitivity as a poet and musician. When still a young shepherd, the future king brought food to his older brothers who were with King Saul encamped against the Philistine army at the Valley of Elah. When the giant Goliath challenged Israel to send out a single warrior to defend the honor of the God against their pagan idols, David asked to go, and defeated Goliath with just three smooth stones from his sling. David played the harp, and also wrote many of the Psalms of the Bible, known for their beauty and prophetic wisdom.